The Broke and the Bookish : Daisy Asks for Your Recommendations! So I just got back from Rome yesterday and it was AMAZING! It's such a beautiful city! And it's a sad day when you realise that all the lovely photos you took are on the boyfriend's phone... Well, the one you see at the top of this post was on mine, so that's what I'm sharing. I LOVE Greek and Roman mythology and anything about the Roman empire and it was just surreal to be walking around the city, visiting what's left of this civilization (seriously, there are gorgeous buildings, statues and fountains EVERYWHERE) and taking it all in. And also eating lots of yummy food. But, you ask yourself, why is she mentioning this on a BOOK blog? I'm getting to it, I promise. In the past I've loved stories about ancient Rome, Gladiator is one of my favourite movies (though as I've now learned, the events in Gladiator are not entirely historically correct), but I'm a little short on novels set in Rome. Which is why I'm asking for your recommendations. And I know you're all awesome at giving those, cause I'm still making my way through the AMAZING ones I got when I asked for fantasy recs! Give me anything set in Rome, I don't care if it's contemporary or historical fiction, I have separation issues when it comes to this city and need to have a list so I can have a fix every now and then. Which is obviously not even close to enough. So please give me lots to work with! Movie recs are welcome as well! 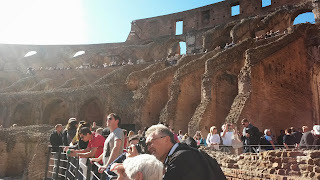 Oooh I was just in Rome this past May/June! It is SUCH a gorgeous city. The cobblestone streets - ! I'm afraid I have no recommendations, but I will hang around here to pick up the recommendations of others! This book isn't set in Rome, though parts do take place there, but it is in Italy. Juliet by Anne Fortier. I discovered this after watching Letters to Juliet and was interested to read it. It has fast become a favorite. If you enjoy early early Roman history and don't mind books with a more religious theme, then try the Mark of the Lion Series by Francine Rivers. The books are Voice in the Wind (1), An Echo in the Darkness (2), and As Sure as the Light (3). They are set mostly in Rome/Ephesus for the first two. Germany for the 3rd. And Jerusalem & Germany in both books 1 & 2. But they are VERY good. I'll have to check the series out, thanks! Roman Holiday is a must! Beach Music by Pat Conroy basically caused me to spend a semester in Rome in college. Its amazing! Thanks for the recs! I'd never heard of Roman Holiday before! Instructions For a Broken Heart! It sounds so good!! :) Thanks! I'm seconding this book. It's super cute! I second Dawn's recommendation of the Mark of the Lion Series. They are religious books but they have some of the highest ratings on Goodreads that I have seen. Consider them added to the list! I hadn't heard of Mark of the Thief before, it looks like a me kind of book! :D Thanks! Roman Holiday with Gregory Peck and Audrey Hepburn! Cleopatra's Daughter by Michelle Moran! 7 novels that go from 110 BC to 27 BC--my favorite was Caesar's Women. I also really enjoyed Richard Harris's Pompeii and Imperium, and his Conspirata is on my reading shelf. I liked Kate Quinn's Mistress of Rome, but some of the speech was too modern sounding for my taste; I had mixed feelings about Michelle Moran's Cleopatra's Daughter (again, the heroine seemed way to modern and typical of a rebellious spoiled girl). I love reading about ancient Rome also, and just started a mystery series set in Roman Britain by Ruth Downie. You should definitely go there if you get the chance! The same thing happened to me when I came home from Italy! I've been searching for Italy/Rome books ever since. Here's my Italy Goodreads shelf. Maybe you'll find something that sounds good! So glad I'm not the only one ;) And that list is awesome, thanks for sharing! The Imperfectionists by Tom Rachman- great book (and also about a failing newspaper, so you have that interesting aspect too). cleopatra's daughter is a mist read historical fiction about what happens to cleopatras children after she is killed. I read it a couple of years ago and loved it :) It's definitely one I'd recommend as well! I highly recommend Curses and Smoke by Vicky Alvear Shecter. It's set in Pompeii and has a lot of interesting - and, from what I've heard, accurate - historical information. I hadn't heard of that one before, added it to the TBR, thanks! Rosemary Sutcliff writes some great books about ancient romans. One I read, The Eagle of the Ninth, was set in Great Britain, but its about a Roman centurion and it's historically accurate and a great read. I've read it a couple times and really enjoyed it. In Eat, pray, love 1/3 of the book is set in Rome, I love the way the author descrives the city... So much love! Cleopatra's Daughter by Michelle Moran is set in Rome. Roman Holiday is amazing. If you could go Rome adjacent, Under the Tuscan Sun is good. Um, there's the Roma Sub Rosa series by Steven Saylor - they're very historically accurate and it's a crime series (it follows a detective)...I'm reading the fourth book (I haven't read the rest of the series) but it's really good so far. I also love the Troy series by David Gemmell; the first book is Lord of the Silver Bow. It's almost like an alternate history fantasy because it's a reimagining of the Trojan War but it reads more like historical fiction. The gods and goddesses aren't involved except for the normal religious ways. And the characters are FANTASTIC. I ripped through all three books, also very compelling and cinematic. I saw someone mention Curses and Smoke, that was one of my favorite reads this year. Excellent and quick. On the other end of the spectrum is Cleopatra (and Helen of Troy) by Margaret George. They're 900 pages each but they are magnificent and you never get bored. Cleopatra in particular was fascinating and goes from Egypt to Rome.